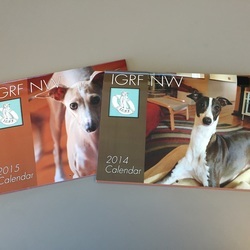 IGRF-NW fourth-annual calendar fundraising auction just ended. This beautiful calendar is produced for 2016 featuring YOUR iggy(yes)! If you act quickly, there's still time to order calendars (scroll down to the bottom to order). All the proceeds from the calendar are used to pay for medical and other expenses for the rescued Italian Greyhounds here in the Pacific Northwest. Did you know that all of our fosters are now micro chipped because of your generosity? We want to ensure that if a dog gets lost, we can find him or her. Once in awhile a rescue comes in who needs special medication or a medical test that the national organization can’t pay for—but your donations make it possible. We hope that as many IG owners and fanciers as possible will join in making this a huge success. We know that this is a tough economy, so there are even some free options. Even if you can’t afford to bid on an “Iggy of the Month” photo spot, your very own IG can still be featured in the calendar. ﻿Auction Winners: Congratulations on your winning bid for Iggy of the Month. We’re looking forward to seeing the photo you choose! The deadline for receiving photos is Saturday, November 28th. In selecting your photo, please be sure the photo is a large, clear photo—not too dark, and no “red eye”. The ideal pixel size is somewhere around 3300 x 2550 pixels. Anything close to that usually looks great. Even down to about half that resolution —1650 x 1275 — looks pretty good. You can see the pixel size either by opening the image in any photo editor or by looking at the file info. The printer prefers a JPG (or JPEG) format. Email the photo to igrfnw@gmail.com by November 28th. We expect to receive the calendars from the printer mid-December and will ship them out right away. Don’t forget to order more calendars for holiday presents! Have you purchased your dog's birthday spot on the calendar? Order right on this page! Thank you for your support. Purchase your calendar for just $20, postage included. Upon checkout, include your shipping address or, if you would like to pick up your calendar in person, let us know and we'll contact you when they come in. Picking it up in person will essentially donate a extra few dollars to the fundraiser! Thanks!